Last week’s story points to the awkward relationship between traditional in-store selling and on-line shopping in today’s retail sector. In many stores, customers have to choose between shopping on-line from their personal computers or shopping in-store. However by installing an in-store computer, North Face would have bridged the “bricks and clicks” gulf and increased the likelihood of making a sale. Furthermore, sales staff might be called upon to browse the catalogue with the customer in the same way they would browse the racks, giving the customer’s on-line experience the personal touch they were seeking when they entered the store in the first place. The lesson here: the technologies may have changed, but customer demands for knowledgeable and convenient service remains the same. There should be an award for brands that use retail design visuals and experiences to create must-have, mouth watering urges for the product and then develop technologies that satisfy these urges at the touch of a button. Sprinkles is a winner. Management leverages the powerful eye appeal of the cupcakes themselves, displayed in lovely, tempting rows behind the glass within the store. At this Sprinkles store on Chicago’s Gold Coast, the entire facade of the building seduces with raised cupcake structures suggesting something of the variety and fun of the cakes in the store. They then adapt technologies from the convenience banking sector to deliver immediate satisfaction to their customers. The cupcake phenomenon draws long lines of customers craving a sweet at any time of the day. Management eventually realized that seduction appeals go flat if customers have to wait in line too long. 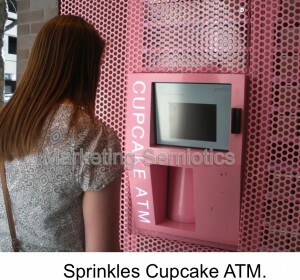 So they installed the “Sprinkles’ ATM” outside near the entrance to the store, which enables eager customers to satisfy their impulses by making the order from a computer using a credit card, and receiving the tasty treat automatically from a window. Sprinkles identified connections between the sensory and hedonistic appeals of their products and built a technology that would move customers from desire to satisfaction as smoothly as possible. The future of retailing will be defined by strategies that integrate real and virtual consumer experiences and continue to deliver superior customer service regardless of the shopping medium, technology, or product category. The mobile app is another example. Read more in next week’s blog.